Plug into XH balance plug on your Lipo Battery and it will read out overall voltage, individual cell voltage, and has a low voltage alarm. The Lipo Alarm is designed to help prevent your lithium polymer batteries from being over-discharged during use. When lipo batteries are discharged to less than 3.0V-per-cell, they can be permanently damaged and even potentially dangerous. 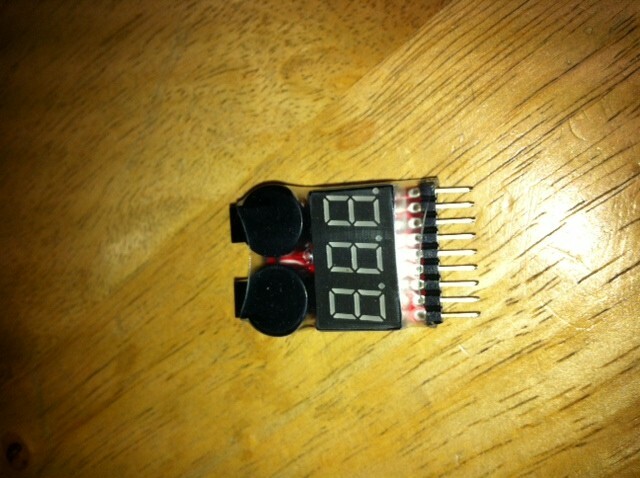 The Lipo Alarm uses both a 95dB buzzer. If the battery is discharged to 3.15V-per-cell or less, the buzzer will sound. For use with 7.4V (2-cell) through 22.2V (6-cell) lipo batteries. JPH Note: Works with XH plug, will not work with Thunder Power (needs adaptor). These work great for an esc that does not have a LVC. Also works great for scaler light batteries.